Summer games for kids - Outdoor games for kids that everyone will love! Kids get bored in Summer. It is inevitable! 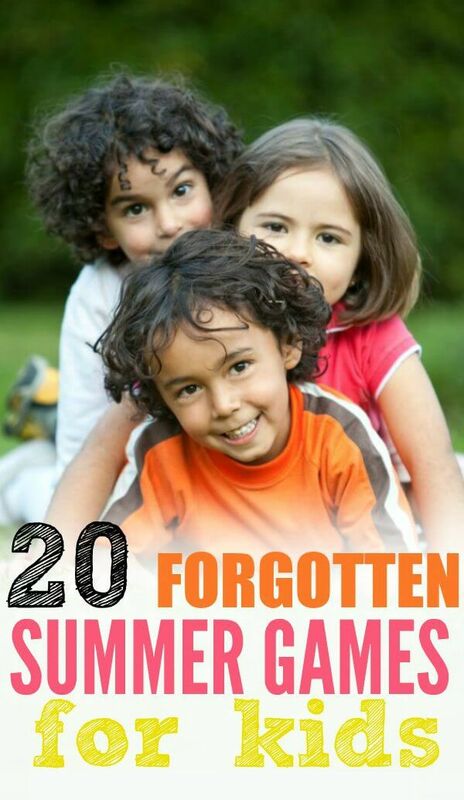 But you can stop them in their tracks with some forgotten Summer games for kids. They will have a blast being so creative! Our kids are always saying they are bored….especially during the summer. One year we were building our house but we had already sold our other house. I moved our entire family into my father’s house for the Summer and we had nothing. We had packed up most of the toys, so they kids were left with some of the basics. However, it was one of our favorite Summers. We were “forced” to play together and get creative. We started bringing back the old games of having jump rope contests to hoola-hoops to playing some games that I played as a child. 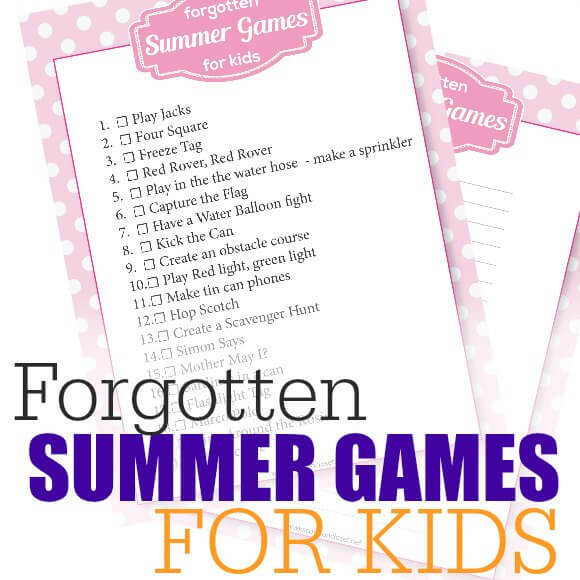 Today I’m not only listing some of these forgotten Summer games for kids to help you with those bored children, but I also have a printable for you too (just scroll to the bottom)! That way you can literally check them off as you use them. AND…. I have also included a blank printable, so you can make up some of your own forgotten games that you want to play with your children. Several of these are fun outdoor games for kids too! No excuses to get the kids outside because now you have a list for them to do when they come whining that they are bored. Get the kids active with these fun outdoor games for kids in the summer. Jacks is a super fun game to play but you do need to purchase a jack set. However, you can get them very inexpensively on Amazon. sometimes I even find them at my local dollar store. The object of the game of four square is to eliminate players in higher squares so that you can advance to the highest square yourself. The ball is bounced between players in squares until someone makes an error and is eliminated. This is one of my all time favorite games as a kid. All you need is side walk chalk and a four square ball to play this game. Make sure you read all the four square rules here. Just like “regular” tag you have an “It” person. That person who is it runs around and tries to tag other people. If someone is tagged then they are frozen. They have to stay frozen until they are touched and unfrozen by another team member. You can make this fun, like maybe someone has to go under their legs to unfreeze them, or hit them with a water balloon, or give them a high five. You can change the rules just a little bit to adjust it to the day or party. Two teams line up opposite each other, no more than 30 feet apart. The first team calls one player from the opposite team, and chants together, “Red Rover, Red Rover, send (player’s name) on over!” The person called runs to the other line and attempts to break the chain (formed by the linking of hands). If the person fails to break the chain, this player joins the team that called Red Rover. But, if the player successfully breaks the chain, he may “capture” either of the two players whose link was broken by the dash, and bring them back to his original team. Teams take turns calling out Red Rover and challenging a player on the opposing team. The idea is to get as many people on your team. This is such a fun game. Now, who doesn’t have fond memories of children playing in a water hose? I know we did. I thought I would give you a few fun ideas. I loved her idea of almost turning a slide into a slip in slide – so frugal and fun for the kids. I loved how she made a pool noodle into a sprinkler. You can build your own sprinkler with a soda bottle. FUN and CHEAP! You can also make a hoola-hoop sprinkler. CUTE! Capture the flag is still one of my boys favorite games. Whether you are a 5 or 15, it is a ton of fun. Head on over here to see all the rules to capture the flag. All you really need is a flag, but we usually use socks or t-shirts. You can even play with water guns or nerf guns to make it even more fun. Water balloon fights use to be annoying because Mom didn’t want to fill up all the water balloons. Not anymore! Now you can fill up 100 water balloons in 60 seconds with these awesome water balloons. You can fill and seal them all in one step! Such a time saver. Kick the can is very similar to hide n seek, so it is a nice variation to the normal game. Head on over here to see the rules on how to play kick the can. You can make your obstacle course as easy or as complicated as you would like. Pinterest has tons of ideas on how to make an obstacle course here. One person is the caller and the other players stand behind a line facing him. The “it person” yells “green light” and the players rush to reach him first. When the it person yells “Red Light” they must freeze. The first person to reach the “it” person wins. However, if they don’t freeze and the “it” person catches them not frozen, they have to go back and start over. Here you can make them with plastic cups. Scavenger hunts are so fun. You can make them small in our backyard, in your house for those rainy days or even make them around the neighborhood or your local park. Pinterest has a TON of scavenger hunt ideas. This is always one of the favorite outdoor games for youth. Simon (the it person) calls out instructions to the entire group of players at the starting line. (for example, Simon Says – take 4 hops forward!, or 2 baby steps forward) They advance towards him, but he then tries to trick them randomly by calling out an order without beginning it with “Simon Says…” If they still move, they’re back at start. The best part is yelling “Simon didn’t say!”). Mother May I? Is very similar to “Red Light Green Light” but the “Mother” calls out instructions to each player individually. (for example, Take 4 baby steps! Take 2 giant jumps) If the player forgets to ask “Mother May I?”, he must go back to the starting line. The winner is the first person to reach the Mother. Basically this is like Hide & Seek – only backwards. There is only 1 hider, and everyone else is “It”. When one of the “It” players finds the hidden sardine, he quietly hides with him. This goes on and one until only one person has not found all the “sardines” packed into the same hiding place. This can be a ton of fun. You are simply playing tag, but in the dark with flashlights. All you need is flashlights. This is so fun, especially for parties when it gets dark outside. Marco polo is often played in a pool but really… you can play it anywhere. It would be fun to play in the back yard or even in the house. How to play Marco Polo. Ring around the rosie is a fun game for little kids, but it is also fun for big kids. The bigger kids tend to enjoy trying to pull the others down instead of just falling down. Tic Tac Toe is normally played with pencil and paper but I have seen where people have played them all different ways. Here are a few of my favorites. She made a giant one with paper plates – perfect for a rainy day. Here is one that they made with legos!! Super cute and great for car rides. Here is one with frisbees. I know my boys would love this. Well… now that we talked about the fun Summer games for kids. 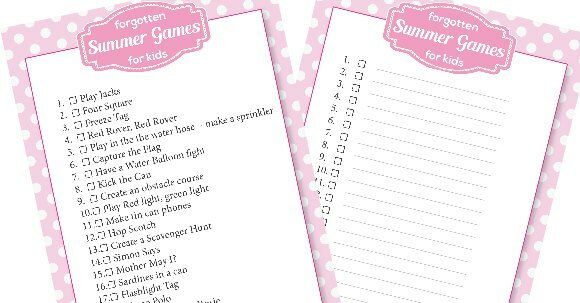 I have a printable for you with fun outdoor games for kids of all ages! 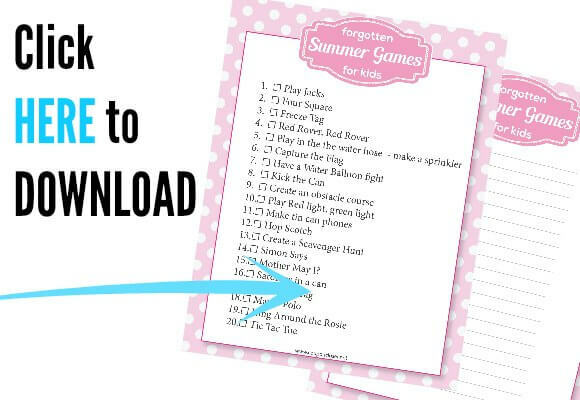 You will love all the free printable summer games! There are so many summer games to play. From crazy outdoor games to nursery rhyme games and educational games plus so much more! No one will be bored with these fun summer games for kids. Summer days will be a blast with these outdoor games. Get ready for tons of family fun! Choose what game to play and get started with summer fun! If you plan on on taking any camping trips, try these fun games. Bean bag and ring toss are always fun games for kids. And don’t forget a classic game of water balloons! We even have life sized version puzzle games. Those are such fun lawn games. You can also make an obstacle course. No one will be bored with so many fun games and activities. There are lots of free games for kids if you need a budget friendly option! Many of these ideas are good picnic games for kids if you have cookouts, BBQ’s or other things planned. Everyone will have a blast with these fun easy outdoor games for kids! Get the kids moving with these summer games for kids. Try this DIY Bug Spray this summer. It works wonders and you do not have to worry about harsh chemicals. It’s very simple to make and only requires a few ingredients.